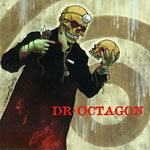 Instrumental version of the critically acclaimed album collaboration between Kool Keith and Dan the Automator. Automator spices it up with some added instrumentation for the beat heads who crave the music behind the album. Listen with discretion!